Pink Paper Castle: Babies Day Out!! These days I have a lot of friends and sisters who are expecting babies anytime soon!! 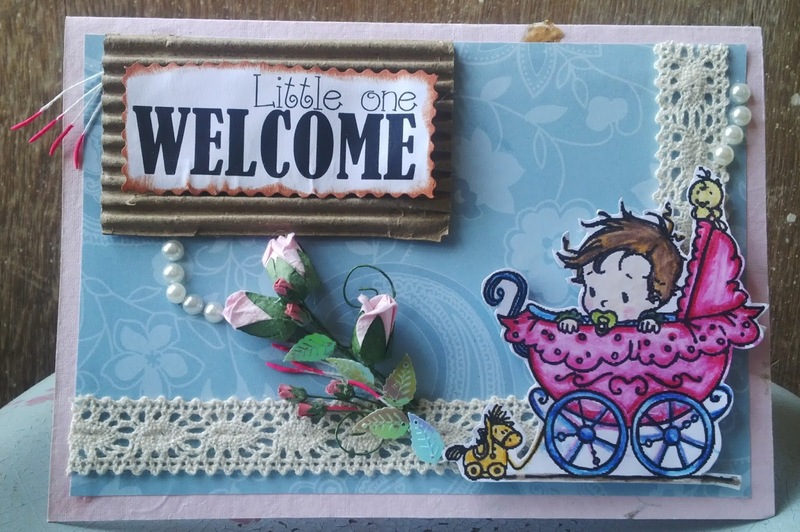 And so, I thought of making a card to welcome the little ones in this world!! For the card, I have used a light-pink colored handmade sheet as the base. And then added a layer of blue-printed sheet. And then topped it with the beautiful off-white lace. The wonderful image is from Wee stamps named - Wee One. It is available here http://www.weestamps.com/?page_id=27. I have colored the image is blue as well as pink (because whether its a boy or a girl..it really does not matter). I have embellished the card with pink tulips along with dull red mini rose buds along with sparkly green leaved. I also added pearls to give it a royal welcome touch. Also I placed the sentiment on a brown corrugated sheet and embellished it with some hot-pink pollen. Wonderful card ... adorable image. Thanks for joining us at JIC! OMGosh this is so cute, love the image and the colors. Some expecting Mom is going to love this one! Thanks for playing with us over at Loves Rubberstamps!!! Thanks for joining our sentiment challenge this week at Loves Rubberstamps! Hope to see you again soon! Very cute ! Great for baby showers ! Thank you so much for joining us at Scrapping 4 Fun Challenges ! This is so cute. Just darling. Thanks for joining us this week at A.R.T. Aaah, so very cute - made me smile! Thanks for joining us at Speedy Fox & Friends. Very pretty card, thank you for playing along at scrapping4funchallenges. 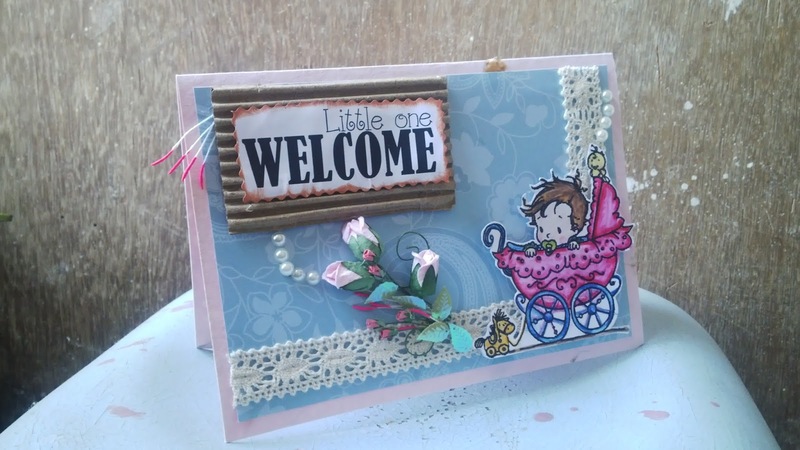 What a cute welcome baby card! Thanks for playing along with us this week at Speedy Fox & Friends blog challenge! Great baby card. thanks for joining us at scrapping 4 fun challenges. This is super cute! Thanks for playing at HIMCR. Wonderful card, love the colors and the image is so sweet, nicely done! Thank you everyone for commenting!!.. Its really heart-warming to see such beautiful comments!! Absolutely adorable! Thanks so much for playing along ItsyBitsy's Pretty 'P' Challenge. All the very best! Another very pretty project Divya, great layout and that lace is a perfect touch!